Darker shades indicate an absolute majority (greater than 50%). Christianity is the largest religion in Germany, comprising an estimated 57% of the country's population in 2017. The second largest religion in Germany is Islam, with around 4 million adherents (5% of the population), almost all of them have full or partial foreign background. Smaller religious groups include Buddhism (0.2%), Judaism (0.1%), Hinduism (0.1%) and others (0.4%). About 36–37% of the country's population are not affiliated with any church or religion. The two largest Christian churches of the country are the Roman Catholic Church and the Evangelical Church in Germany (EKD), a Protestant confederation of United Protestant (Lutheran and Reformed) churches. The two churches together comprised 54% of the population in 2017, of whom 28.2% belonged to the Catholic Church and 26.1% to the Evangelical Church. In 2016, the Orthodox Church constituted ~2% of the population and other minor Christian churches (including Jehovah's Witnesses, The Church of Jesus Christ of Latter-day Saints, other Protestant denominations, and others), formed 1–1.5%. Demographics of religion in Germany vary greatly by region and age. In a 2006 study, 28% of Germans under the age of 25 said they did not believe in God or any supernatural power. Non-religious people (including atheists and agnostics) represent the majority in some of Germany's major cities, including Berlin and Hamburg, and the absolute majority of 70–80% of the population in all the eastern states of what between 1949 and 1990 used to be the German Democratic Republic; by contrast, rural areas of the western states of what in the same period used to be the Federal Republic of Germany are more religious, and some rural areas are highly religious. Ancient Germanic paganism was a polytheistic religion practised in prehistoric Germany and Scandinavia, as well as Roman territories of Germania by the 1st century AD. It had a pantheon of deities that included Donar/Thunar, Wuotan/Wodan, Frouwa/Frua, Balder/Phol/Baldag, and others shared with northern Germanic paganism. Celtic paganism and later Gallo-Roman syntheses were instead practised in western and southern parts of modern Germany, while Slavic paganism was practised in the east. In the territories of Germany under the control of the Roman Empire (the provinces Germania Superior and Germania Inferior), early Christianity was introduced and began to flourish after the 4th century. 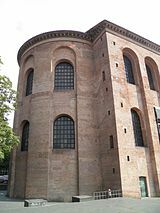 Although pagan Roman temples existed beforehand, Christian religious structures were soon built, such as the Aula Palatina in Trier (then the capital of the Roman province Gallia Belgica), completed during the reign of Roman emperor Constantine I (306-337 AD). During the Carolingian period, Christianity spread throughout Germany, particularly during the reign of Charlemagne (r. 800-814 AD) and his expansionary military campaigns. Religious structures built during the Carolingian period include the Palatine Chapel, Aachen, a surviving component of the Palace of Aachen built by architect Odo of Metz during the reign of Charlemagne. Territories of the present-day Germany, like much of Europe, were entirely Roman Catholic with religious break-offs being suppressed by both the Papacy and the Holy Roman Emperor. Roman Catholicism was the sole established religion in the Holy Roman Empire until the advent of the Protestant Reformation changed this drastically. In the early 16th century abuses (such as selling indulgences in the Catholic Church) occasioned much discontent, and a general desire for reform emerged. 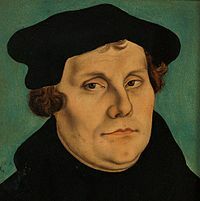 In 1517 the Reformation began with the publication of Martin Luther's 95 Theses detailing 95 assertions which Luther believed showed corruption and misguidance within the Catholic Church. The Reformation demonstrated Luther's disagreement both with the way in which the higher clergy used and abused power, and with the very idea of a papacy. In 1521 the Diet of Worms outlawed Luther, but the Reformation spread rapidly. Luther translated the Bible from Latin to German, establishing the basis of the modern German language. A curious fact is that Luther spoke a dialect which had minor importance in the German language of that time. After the publication of his Bible translation, his dialect evolved into what is now standard modern German. With the protestation of the Lutheran princes at the Imperial Diet of Speyer (1529) and rejection of the Lutheran "Augsburg Confession" at the Diet of Augsburg (1530), a separate Lutheran church emerged. From 1545 the Counter-Reformation began in Germany. Much of its impetus came from the newly founded (in 1540) Jesuit order. It restored Catholicism to many areas, including Bavaria. 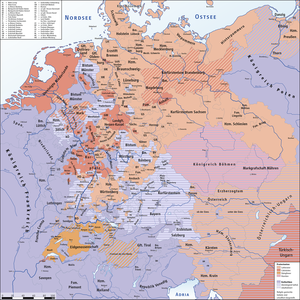 The Holy Roman Empire became religiously diverse; for the most part, the states of northern and central Germany became Protestant (chiefly Lutheran, but also Calvinist/Reformed) while the states of southern Germany and the Rhineland largely remained Catholic. In 1547 the Holy Roman Emperor Charles V defeated the Schmalkaldic League, an alliance of Protestant rulers. The Peace of Augsburg in 1555 brought recognition of the Lutheran faith. But the treaty also stipulated that the religion of a state was to be that of its ruler (cuius regio, eius religio). In 1608/1609 the Protestant Union and the Catholic League formed. The Thirty Years' War (1618–1648), one of the most destructive conflicts in European history, played out primarily in German lands, but involved most of the countries of Europe. It was to some extent a religious conflict, involving both Protestants and Catholics. Two main developments reshaped religion in Germany after 1814. There was a movement to unite the larger Lutheran and the smaller Reformed Protestant churches. The churches themselves brought this about in Baden, Nassau, and Bavaria. However, in Prussia King Frederick William III was determined to handle unification entirely on his own terms, without consultation. His goal was to unify the Protestant churches, and to impose a single standardised liturgy, organisation, and even architecture. The long-term goal was to have fully centralised royal control of all the Protestant churches. In a series of proclamations over several decades the Evangelical Church of the Prussian Union was formed, bringing together the more numerous Lutherans and the less numerous Reformed Protestants. The government of Prussia now had full control over church affairs, with the king himself recognised as the leading bishop. Opposition to unification came from the "Old Lutherans" in Prussia and Silesia who followed the theological and liturgical forms they had followed since the days of Luther. The government attempted to crack down on them, so they went underground. Tens of thousands migrated to South Australia and the United States, where they formed the Missouri Synod. Finally, in 1845 the new king, Frederick William IV, offered a general amnesty and allowed the Old Lutherans to form separate free church associations with only nominal government control. From the religious point of view of the typical Catholic or Protestant, major changes were underway in terms of a much more personalised religiosity that focused on the individual more than the church or the ceremony. Opposing the rationalism of the late 18th century, there was a new emphasis on the psychology and feeling of the individual, especially in terms of contemplating sinfulness, redemption, and the mysteries and the revelations of Christianity. Pietistic revivals were common among Protestants. Among Catholics there was a sharp increase in popular pilgrimages. In 1844 alone, half a million pilgrims made a pilgrimage to the city of Trier in the Rhineland to view the Seamless robe of Jesus, said to be the robe that Jesus wore on the way to his crucifixion. Catholic bishops in Germany had historically been largely independent of Rome, but now the Vatican exerted increasing control, a new "ultramontanism" of Catholics highly loyal to Rome. A sharp controversy broke out in 1837-38 in the largely Catholic Rhineland over the religious education of children of mixed marriages, where the mother was Catholic and the father Protestant. The government passed laws to require that these children always be raised as Protestants, contrary to Napoleonic law that had previously prevailed and allowed the parents to make the decision. It put the Catholic Archbishop under house arrest. In 1840, the new King Frederick William IV sought reconciliation and ended the controversy by agreeing to most of the Catholic demands. However Catholic memories remained deep and led to a sense that Catholics always needed to stick together in the face of an untrustworthy government. Chancellor Otto von Bismarck would not tolerate any base of power outside Germany – in Rome – having a say in German affairs. He launched a Kulturkampf ("culture war") against the power of the pope and the Catholic Church in 1873, but only in Prussia. This gained strong support from German liberals, who saw the Catholic Church as the bastion of reaction and their greatest enemy. The Catholic element, in turn, saw the National Liberals, who often happened to be Protestant, as its worst enemy and formed the Center Party. Catholics, although about a third of the national population, were seldom allowed to hold major positions in the Imperial government or the Prussian government. After 1871, there was a systematic purge of Catholics; in the powerful interior ministry, which handled all police affairs, the only Catholic was a messenger boy. Jews were likewise heavily discriminated against. As of 1878, only three of eight Prussian dioceses still had bishops, some 1,125 of 4,600 parishes were vacant, and nearly 1,800 priests ended up in jail or in exile. ...Finally, between 1872 and 1878, numerous Catholic newspapers were confiscated, Catholic associations and assemblies were dissolved, and Catholic civil servants were dismissed merely on the pretence of having Ultramontane sympathies. Bismarck underestimated the resolve of the Catholic Church and did not foresee the extremes that this struggle would entail. The Catholic Church denounced the harsh new laws as anti-catholic and mustered the support of its rank and file voters across Germany. In the following elections, the Center Party won a quarter of the seats in the Imperial Diet. 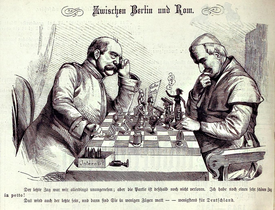 The conflict ended after 1879 because Pius IX died in 1878 and Bismarck broke with the Liberals to put his main emphasis on tariffs, foreign policy, and attacking socialists. Bismarck negotiated with the conciliatory new pope Leo XIII. Peace was restored, the bishops returned, and the jailed clerics were released. Laws were toned down or taken back (Mitigation Laws 1880-1883 and Peace Laws 1886/87), but the main regulations such as the Pulpit Law and the laws concerning education, civil registry (incl. marriage), or religious disaffiliation remained in place. The Center Party gained strength and became an ally of Bismarck, especially when he attacked socialism. The national constitution of 1919 determined that the newly formed Weimar Republic had no state church, and guaranteed freedom of faith and religion. Earlier, these freedoms were mentioned only in state constitutions. Protestants and Catholics were equal before the law, and freethought flourished. The German Freethinkers League attained about 500,000 members, many of whom were atheists, before the organisation was shut down by the Nazis in May 1933. When Adolf Hitler's Nazi Party seized power in January 1933, it sought to assert state control over the churches, on the one hand through the Reichskonkordat with the Catholic Church, and the forced merger of the German Evangelical Church Confederation into the Protestant Reich Church on the other. The concept of Positive Christianity and the Deutsche Christen movement sought to reconcile tenets of National Socialism with the Christian religion. This policy seems to have gone relatively well until late 1936, when a "gradual worsening of relations" between the Nazi Party and the churches saw the rise of Kirchenaustritt ("leaving the church"). Although there was no top-down official directive to revoke church membership, some Nazi Party members started doing so voluntarily and put other members under pressure to follow their example. Those who left the churches were designated as Gottgläubig: they believed in a higher power, often a creator-God with a special interest in the German nation, but did not belong to any church, nor were they atheists. Many were Germanic neopagans. This movement, especially promoted by Reichsführer-SS Heinrich Himmler, remained relatively small and by 1939, 3.5% of Germans identified as Gottgläubig; the overwhelming majority of 94.5% remained Protestant or Catholic, and only 1.5% did not profess any faith. Since January 1933, Jews in Germany were increasingly marginalised, expelled and persecuted for a combination of religious, racial and economic reasons. From 1941 to the fall of Nazi Germany in 1945, they were actively massacred during the Holocaust. 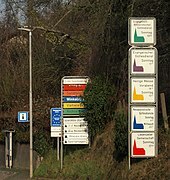 Since 2008 all religions are presented on road signs. After World War II, Germany was split in two states by the Western Allies, who formed West Germany, and the Soviets, who established East Germany. The former, the Federal Republic of Germany, adopted a constitution in 1949 which states that no one may be discriminated against due to their faith or religious opinions, and that no state church exists in Germany; consequently, secularisation in West Germany proceeded slowly. The latter, the German Democratic Republic, had a communist system which actively tried to reduce the influence of religion in society; Christian churches were restricted by the government. In the 21st century, eastern German states including the capital East Berlin are less religious than western German states. Religious communities that are of sufficient size and stability and are loyal to the constitution can be recognised as Körperschaften öffentlichen Rechtes (statutory corporations). This gives them certain privileges, for example being able to give religious instruction in state schools (as enshrined in the German constitution, though some states are exempt from this) and having membership fees collected (for a fee) by the German revenue department as "church tax": a surcharge of between 8 and 9% of the income tax. The status mainly applies to the Roman Catholic Church, the mainline Evangelical Church in Germany, a number of free churches, and Jewish communities. There has been much discussion about allowing other religious groups like Muslims into this system as well. In 2018, representatives from Lower Saxony, Schleswig-Holstein, Hamburg and Bremen have concluded a decision has to be made by their state parliaments on whether to make Reformation Day a permanent official holiday. This initiative began after an all-German 500th Reformation anniversary in 2017 and also due to the fact that the northern German states have significantly fewer holidays than the southern ones. In 2018, Hamburg, Schleswig-Holstein, Bremen and Lower Saxony adopted resolutions making it an official holiday. Belief in a God by country (2010). 44% of Germans agreed with the statement "I believe there is a God". Nowadays, Protestantism is concentrated in the north and Catholicism is concentrated in the south and west, while unaffiliated people are concentrated in the east, where they make up the majority of the population, and are significant in the west of the country, mainly in metropolitan areas. The Catholic state of Bavaria gave the Roman Catholic Church a pope, Benedict XVI (2005–2013). 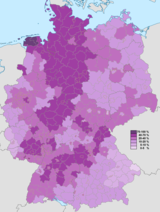 With the decline of Christianity in the late 20th and early 21st century, accentuated in the east by the official atheism of the former German Democratic Republic, which has been sharper for Protestantism, the northeastern states of Germany are now mostly not religious (70%), with much of the people living there being agnostics and atheists. Immigrations in the late 20th and early 21st century have brought new religions into Germany, including Orthodox Christianity and Islam. Orthodox Christianity is practised among immigrated Greeks, Serbs, Russians, Romanians and other communities. Most Muslims are Sunnis and Alevis of Turkish origin, but there are a small number of Shi'a Muslims and other currents. Moreover, Germany has Europe's third-largest Jewish population (after France and the United Kingdom). German major religious bodies publish yearly updated records of their membership. According to these, Christianity is the largest religious group in Germany, with around 48 million adherents (~58.5%) in 2016 of whom 23.6 million are Catholics (28.6%) and 21.9 million are Protestants (26.6%). Orthodox Christianity has 1.5 to 2.0 million members or ~2% of the population. Other minor Christian religions counted together have approximately 1.3 million members, forming 1–1.5% of the total population. The second largest religious group in Germany is Islam with around 4 million adherents, forming ~5% of the population in 2016. Demographers estimate that in Germany there are around 100,000 religious Jews (Judaism), and a further 90.000 ethnic Jews with no religion, around 100,000 Yazidis, 130,000 Hindus, and 270,000 Buddhists. The latest census in 2011 found that Christianity was the religion of 51,865,590 people or 64.2% of the total population, among whom 24,869,380 or 31.2% were Catholics, 24,552,110 or 30.8% were Protestants of the Evangelical Church in Germany, 714,360 or 0.9% were members of Protestant free churches, and 1,050,740 or 1.3% were members of Eastern Orthodox and Oriental Orthodox churches. Jews were 83,430 people or 0.1%, and 2,116,460 or 2.7% were members of other religions. The remaining 26,265,880 people, or 33.0% of the total German population, were not believers in or not members of any religion (including atheists, agnostics and believers in unrecognised religions). ^ a b c Weimar Republic borders, i.e. German state borders of 31 December 1937. ^ a b c Aggregated data from the Federal Republic of Germany and from the Democratic Republic of Germany, excluding the Saar Protectorate until 1956. ^ The censuses were carried out in different years; that of West Germany was done on 6 June 1961 while that of East Germany was done on 31 December 1964. ^ Data from 1910 to 1939 included non-religious Germans, non-religious Jews, and people of non-Christian religions, while religious Jews were counted separately. From 1939 onwards non-religious people were counted separately. Data from 1946 to the 1960s included Jews, who otherwise did not have a separate category. ^ Excluded members of any non-Christian religion living in East Germany. ^ Included members of any non-Christian religion living in East Germany. In 2017, a survey conducted by Pew Research Center found that 71% of German adult population consider themselves Christians when asking about their current religion (irrespective of whether they are officially members of a particular Christian church). The same survey shows that most of Christians in Germany are non-practicing (defined as people who identify as Christians, but attend church services no more than a few times per year). 5% of people questioned state they have a non-Christian religion and 24% are of no religion. In 2016, the German Politbarometer, found that 34.2% of the adult population entitled to vote were Protestants, 31.9% were Catholics, 28.8% were unaffiliated, 2.5% were Muslims, 0.02% were Jews and 1.8% were affiliated with an other religion. A further 0.9% did not answer to the question. In 2016, the German General Social Survey found that 64.5% of Germans declared themselves to be affiliated to a Christian denomination, 30.5% were Catholics, 29.6% were members of the Evangelical Church, 1.7% were members of the Evangelical Free Church, 1.4% were Orthodox and 1.3% were other Christians. Non religious people comprised the 32.4% of the population, Muslims were the 2.6% and 0.5% were members of other religions. In 2015, Eurobarometer found that 72.6% of the adult population were Christians, the largest Christian denomination being Protestantism, comprising 33.1% of the population, followed by Catholicism with 31.1%, and Eastern Orthodoxy with 0.9%, and unspecified other forms of Christianity with 7.5%. A further 2.2% were Muslims, 0.4% were Buddhists, 0.1% were Jews and 1.3 belonged to other religions. A further 23.5% of the population were not religious, comprising 12.8% who were atheists and 10.7% who were agnostics. The Eurobarometer Poll 2010 found that 44% of German citizens responded that "they believe there is a God", 25% responded that "they believe there is some sort of spirit or life force" and 27% responded that "they don't believe there is any sort of spirit, God or life force". 4% gave no response. According to a 2015 Worldwide Independent Network/Gallup International Association (WIN/GIA) poll, 34% of adult citizens said that they are religious, 42% said that they are not religious and 17% said that they are convinced atheists. 7% gave no response. In 2018, according to a study jointly conducted by London's St Mary's University's Benedict XVI Centre for Religion and Society and the Institut Catholique de Paris, and based on data from the European Social Survey 2014–2016, among 16 to 29 years-old Germans 47% were Christians (24% Protestant, 20% Catholic, 2% Orthodox and 1% other Christian), 7% were Muslims, 1% were of other religions, and 45% were not religious. The data was obtained from two questions, one asking "do you consider yourself as belonging to any particular religion or denomination?" to the full sample of 900 people, and the other one asking "which one?" to the sample who answered "yes". In 2016, the survey Politbarometer provided data regarding religion in each of the states of Germany for adults who are entitled to vote (18+), as reported in the table below. Christianity is the dominant religion of Western Germany, excluding Hamburg, which has a non-religious plurality. Irreligion is predominant in Eastern Germany, which was the least religious region amongst 30 countries surveyed in a study in 2012. At its foundation in 1871, the German Empire was about two-thirds Protestant incurring a significant drop to 26.6% by 2016. In 1871 one-third of the population was Roman Catholic, slightly reduced to 28.6% by 2016. In 1871 there was also a notable Jewish minority which was largely exterminated during the Holocaust. Other faiths existed in the state, but never achieved the demographic significance and cultural impact of these three confessions. As of 2016, Christianity with around 48 million members is the largest religion in Germany (~58.5% of the population)  Consequently, a majority of the German people belong to a Christian community, although many of them take no active part in church life. About 2% of the population is Orthodox Christian and about 1–1.5% follows other forms of Christianity (including other Protestantisms, Jehovah's Witnesses, Mormonism and others). Cologne Cathedral in Cologne is a UNESCO World Heritage Site. The Coptic Orthodox Monastery of St. Antonious in Waldsolms-Kröffelbach, Germany. As of 2016 about 35–36% of the Germans are irreligious. Before World War II, about two-thirds of the German population was Protestant and one-third was Roman Catholic. In the north and northeast of Germany especially, Protestants dominated. In the former West Germany between 1945 and 1990, which contained nearly all of Germany's historically Catholic areas, Catholics have had a small majority since the 1980s. 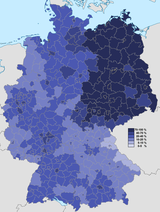 Due to a generation behind the Iron Curtain, Protestant areas of the former states of Prussia were much more affected by secularism than predominantly Catholic areas. The predominantly secularised states, such as Hamburg or the East German states, used to be Lutheran or United Protestant strongholds. Because of this, Protestantism is now strongest in two strips of territory in the former West Germany, one extending from the Danish border to Hesse, and the other extending northeast-southwest across southern Germany. There is a non-religious majority in Hamburg, Berlin, Brandenburg, Saxony, Saxony-Anhalt, Thuringia, and Mecklenburg-Vorpommern. In the eastern state of Saxony-Anhalt only 19.7 percent belong to the two big denominations of the country. This is the state where Martin Luther was born and lived most of his life. In what used to be East Germany both religious observance and affiliation are much lower than in the rest of the country, after forty years of Communist rule. The government of the German Democratic Republic encouraged a state atheist worldview through institutions such as Jugendweihen (youth consecrations) — secular coming-of-age ceremonies akin to Christian confirmation which all young people were encouraged to attend. The number of christenings, religious weddings, and funerals is also lower than in the West. According to a survey among German youths (aged 12 to 24) in the year 2006, most German youths are non-religious (51%). 30% of German youths stated belief in a personal god, 19% believe in some kind of supernatural power, 23% share agnostic views and 28% are atheists. Islam is the largest non-Christian religion in the country. There are between 4 and 4.7 million Muslims, around 5% of the population. The majority of Muslims in Germany are of Turkish origin, followed by those from Pakistan, countries of the former Yugoslavia, Arab countries, Iran, and Afghanistan. This figure includes the different denominations of Islam, such as Sunni, Shia, Ahmadi, and Alevi. Muslims first came to Germany as part of the diplomatic, military, and economic relations between Germany and the Ottoman Empire in the 18th century. Worms Synagogue (originally built 1034) is the oldest still existing synagogue in Germany. 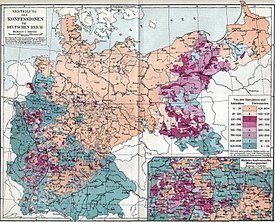 Jewish communities in German speaking regions go back to the 4th century. In 1910, about 600,000 Jews lived in Germany. After Adolf Hitler assumed power in 1933, he began systematically imprisoning and executing Jews in Germany and throughout Nazi occupied Europe. By the end of World War 2, around 6 million Jews had been killed by the Nazi government. About ninety thousand Jews from the former Eastern Bloc, mostly from ex-Soviet Union countries, settled in Germany since the fall of the Berlin Wall. This is mainly due to a German government policy which effectively grants an immigration opportunity to anyone from the Commonwealth of Independent States and the Baltic states with Jewish heritage, and the fact that today's Germans are seen as more significantly accepting of Jews than many people in the ex-Soviet realm. Recently, antisemitic abuse against Jews in Germany has increased. The Central Council of Jews urged Jewish Germans to avoid wearing their kippahs in public. Jews whose religious status is not ascertained — 90,000. They come from Eastern Europe and have no membership in any Jewish community. Central Council of Jews in Germany — 23 national associations of 108 communities comprising approximately 100,500 members in 2014. Japanese Buddhist temple in Düsseldorf. Buddhists are the third largest group of believers in Germany after different religious denominations of Christianity and Islam. There are around 270.000 Buddhists who are living in Germany. Most of them are followers of the Buddhist school of Theravada especially from Sri Lanka. Furthermore, there are followers of Vajrayana, also referred to as Tibetan Buddhism as well as followers of Nichiren Buddhism mainly from Japan and Zen Buddhism from Japan, as well. Around 59,000 Buddhists are from Thailand who follow the school of Theravada and keep 48 temples in Germany and form one of the largest Buddhist community of Buddhists of Asian origin in Germany. Most of the different Buddhist schools and organisation in Germany are members of the non-profit association Deutschen Buddhistischen Union e.V. (DBU). 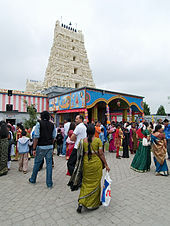 Sri Kamadchi Ampal Hindu temple in the city of Hamm. There are approximately 100,000 Hindus living in Germany. Most of them are Tamil Hindus from Sri Lanka (around 42,000 to 45,000); from India are around 35,000 to 40,000; of German or European origin are around 7,500 and around 5,000 Hindus are originally from Afghanistan. There are also Hindus from Nepal in Germany however this number is very low. In addition, there are Hindus in Germany who are followers of so-called New religious movements or youth sects such as Hare Krishna movement or Transcendental Meditation. These comparatively new religious organisations are considered as neo-Hinduism in the West. The total number of these followers in Germany is comparatively low. Between 10,000 and 20,000 Sikhs are living in Germany. Many Sikhs in Germany have their roots from Punjab region in the north of India, as well as from Pakistan and Afghanistan. Germany has the third highest Sikh population in Europe after United Kingdom and Italy. The city Frankfurt is also known to the Sikhs, as Mini Punjab, because of a great Sikh Population, residing there. There is a large Yazidi community in Germany, estimated to be numbering around 100,000 people. This makes the German Yazidi community one of the largest Yazidi communities in the Yazidi diaspora. A 1997-8 estimate is of 4000 Bahá'ís in Germany (40 in Hannover). In 2002 there were 106 Local Spiritual Assemblies. The 2007-8 German Census using sampling estimated 5-6,000 Bahá'ís in Germany. The Association of Religion Data Archives (relying on World Christian Encyclopedia) estimated some 11,743 Bahá'ís.Following the German reunification in 1989-91 the Federal Constitutional Court of Germany handed down a judgment affirming the status of the Bahá'í Faith as a religion in Germany. Continued development of youth oriented programs included the Diversity Dance Theater (see Oscar DeGruy) which traveled to Albania in February 1997. Udo Schaefer et al. 's 2001 Making the Crooked Straight was written to refute a polemic supported by the Evangelical Church in Germany written in 1981. Since its publication the Evangelical Church in Germany has revised its own relationship to the German Bahá'í Community. Former member of the federal parliament Ernst Ulrich von Weizsaeckercommended the ideas of the German Bahá'í community on social integration, which were published in a statement in 1998, and Chancellor Helmut Kohl sent a congratulatory message to the 1992 ceremony marking the 100th Anniversary of the Ascension of Bahá'u'lláh. 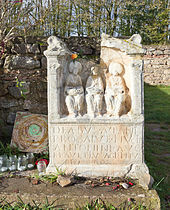 Matronen altar with offerings in Nettersheim. Neopagan religions have been public in Germany at least since the 19th century. Nowadays Germanic Heathenism (Germanisches Heidentum, or Deutschglaube for its peculiar German forms) has many organisations in the country, including the Germanische Glaubens-Gemeinschaft (Communion of Germanic Faith), the Heidnische Gemeinschaft (Heathen Communion), the Verein für germanisches Heidentum (Association for Germanic Heathenry), the Nornirs Ætt, the Eldaring, the Artgemeinschaft, the Armanen-Orden, and Thuringian Firne Sitte. Other Pagan religions include the Celto-Germanic Matronenkult grassroots worship practiced in Rhineland, Celtoi (a Celtic religious association), and Wiccan groups. As of 2006, 1% of the population of North Rhine-Westphalia adheres to new religions or esoteric groups. Church of Scientology in Berlin. The German government provides information and warnings about cults, sects, and new religious movements. In 1997, the parliament set up a commission for Sogenannte Sekten und Psychogruppen (literally "so-called sects and psychic groups"), which in 1998 delivered an extensive report on the situation in Germany regarding NRMs. In 2002, the Federal Constitutional Court upheld the governmental right to provide critical information on religious organisations being referred to as Sekte, but stated that "defamatory, discriminating, or falsifying accounts" were illegal. 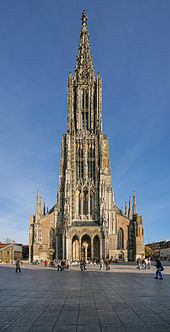 Kirchen (churches) is the term generally applied to the Roman Catholic Church, the Evangelical Church in Germany's member churches (Landeskirchen), and the Orthodox Churches. The churches are not only granted the status of a non-profit organisation, but they have additional rights as statutory corporations (German: Körperschaft des öffentlichen Rechts), which means they have the right to employ civil servants (Beamter), do official duties, or issue official documents. Freikirchen (free churches) is the term generally applied to Protestant organisations outside of the EKD, e.g. Baptists, Methodists, independent Lutherans, Pentecostals, Seventh-day Adventists and others. However, the Old Catholics can be referred to as a free church as well. The free churches are not only granted the tax-free status of a non-profit organisation, but many of them have additional rights as statutory corporations. Sekten is the term for religious groups which do not see themselves as part of a major religion (but perhaps as the only real believers of a major religion). Every Protestant Landeskirche (church whose canonical jurisdiction extends over one or several states, or Länder) and Catholic episcopacy has a Sektenbeauftragter (Sekten delegate) from whom information about religious movements may be obtained. ^ a b c d e f g h i j k l m n o p "Religionszugehörigkeiten in Deutschland 2017" (in German). Retrieved 29 October 2018. ^ a b c d e f g h i j k l m n o p q r s t u v w x y "REMID — Religionswissenschaftlicher Medien- und Informationsdienst" (in German). 2017. ^ a b c d e f g h i j Numbers and Facts about Church Life in the EKD 2018 Report. Evangelical Church of Germany. Retrieved 29 October 2018. ^ Bischofskonferenz, Deutsche. "Kirchenstatistik 2017" (in German). Retrieved 29 October 2018. ^ "EKD-Statistik: Demografischer Wandel macht Kirche weiter zu schaffen". www.ekd.de (in German). Retrieved 29 October 2018. ^ a b Thomas Gensicke: Jugend und Religiosität. In: Deutsche Shell Jugend 2006. Die 15. Shell Jugendstudie. Frankfurt a.M. 2006. ^ a b c Goddyn, Sophie L. (29 April 2014). The Most Godless Region of the World: Atheism in East Germany. Young Historians Conference. Portland State University. Archived from the original on 30 September 2016. ^ "Global Index of Religiosity and Atheism" (PDF). Gallup. Archived from the original (PDF) on 2 August 2017. ^ Leerssen, Joep Leerssen (Spring 2016). "Gods, Heroes, and Mythologists: Romantic Scholars and the Pagan Roots of Europe's Nations". History of Humanities. 1 (1). pp. 71–100. doi:10.1086/685061. ^ Pohlsander, Hans A. (4 Sep 2012) [20 July 2003]. "Constantine I (306 - 337 A.D.)" Rensselaer Polytechnic Institute. Accessed 15 May 2018. ^ Regents of the University of Michigan. "Historic Illustrations of Art and Architecture". University of Michigan Library. Accessed 15 May 2018. ^ Compare: Wilson, Peter Hamish (2009). The Thirty Years War: Europe's Tragedy. Cambridge, Massachusetts: Harvard University Press. p. 9. ISBN 9780674036345. Retrieved 16 June 2017. [...] it was not primarily a religious war. [...] Religion certainly provided a powerful focus for identity, but it had to compete with political, social, linguistic, gender and other distinctions. most contemporary observers spoke of imperial, Bavarian, Swedish, or Bohemian troops, not Catholic or Protestant, which are anachronistic labels used for convenience since the nineteenth century to simplify accounts. The war was religious only to the extent that faith guided all early modern public policy and private behaviour. ^ John K. Zeender in The Catholic Historical Review, Vol. 43, No. 3 (Oct., 1957), pp. 328-330. ^ Blackbourn, David (December 1975). "The Political Alignment of the Centre Party in Wilhelmine Germany: A Study of the Party's Emergence in Nineteenth-Century Württemberg" (PDF). Historical Journal. 18 (4): 821–850. doi:10.1017/s0018246x00008906. JSTOR 2638516. ^ Ronald J. Ross, The failure of Bismarck's Kulturkampf: Catholicism and state power in imperial Germany, 1871-1887 (1998). ^ "Atheist Hall Converted: Berlin Churches Establish Bureau to Win Back Worshipers". The New York Times. 14 May 1933. p. 2. Retrieved 18 September 2010. ^ a b c Steigmann-Gall, Richard (2003). The Holy Reich: Nazi Conceptions of Christianity, 1919-1945. Cambridge: Cambridge University Press. p. 219. ISBN 9780521823715. Retrieved 23 January 2018. ^ Ziegler, Herbert F. (2014). Nazi Germany's New Aristocracy: The SS Leadership, 1925-1939. Princeton, New Jersey: Princeton University Press. pp. 85–87. ISBN 9781400860364. Retrieved 23 January 2018. ^ Encarta-encyclopedie Winkler Prins (1993–2002) s.v. "antisemitisme §2. Oorzaken"; "holocaust". Microsoft Corporation/Het Spectrum. ^ "Gottesdienstschilder jetzt für alle Religionsgemeinschaften" [Worship signs now for all religious communities] (in German). Apd.info. 20 October 2008. Retrieved 8 April 2017. ^ a b "Germany". Berkley Center for Religion, Peace, and World Affairs. Retrieved 28 December 2011. ^ a b c "Zensusdatenbank - Ergebnisse des Zensus 2011". ergebnisse.zensus2011.de. Retrieved 16 May 2018. ^ Muslimisches Leben in Deutschland [Muslim Life in Germany] (PDF) (in German). Nuremberg: Federal Office for Migration and Refugees (German: Bundesamt für Migration und Flüchtlinge), an agency of the Federal Ministry of the Interior (Germany). June 2009. pp. 97–80. ISBN 9783981211511. ^ Blake, Mariah (10 November 2006). "In Nazi cradle, Germany marks Jewish renaissance". Christian Science Monitor. ^ a b c "Zensusdatenbank – Ergebnisse des Zensus 2011 –Personen nach Religion (ausführlich) für Deutschland". Statistische Ämter des Bundes und der Länder. 9 May 2011. ^ "Bevölkerung nach Religionszugehörigkeit (1910–1939)" (PDF). Band 6. Die Weimarer Republik 1918/19–1933. Deutsche Geschichte in Dokumenten und Bildern (in German). Washington, DC: Deutschen Historischen Instituts. ^ "Deutschland: Die Konfessionen" (in German). FOWID. 15 January 2018. ^ a b "Konfession - weighted (Kumulierter Datensatz)". Politbarometer 2016: Question V312.F1. 2016 – via GESIS. The survey was based on a sample of 30,599 people. ^ "Being Christian in Western Europe (survey among 24,599 adults (age 18+) across 15 countries in Western Europe)". Pew Research Center. 29 May 2018. Retrieved 27 June 2018. ^ "Allgemeine Bevölkerungsumfrage der Sozialwissenschaften ALLBUS 2016". GESIS – Leibniz Institute for the Social Sciences (in German). 2016. Retrieved 14 September 2018. ^ "Global Index of Religiosity and Atheism - 2012" (PDF). RED C Research & Marketing Ltd. 2012. Archived from the original (PDF) on 12 August 2012. ^ "Losing our religion? Two thirds of people still claim to be religious" (PDF). WIN Gallup International. 13 April 2015. Archived from the original (PDF) on 30 April 2015. ^ "European Social Survey, Online Analysis". nesstar.ess.nsd.uib.no. ^ a b "Konfession, Bundesland - weighted (Kumulierter Datensatz)". Politbarometer 2016: Question V312.F1. 2016 – via GESIS. Description of study's sample. ^ "WHY EASTERN GERMANY IS THE MOST GODLESS PLACE ON EARTH". Die Welt. 2012. Archived from the original on 26 August 2012. Retrieved 24 May 2009. ^ "East Germany the "most atheistic" of any region". Dialog International. 2012. Retrieved 24 May 2009. 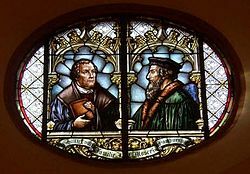 ^ German Protestantism has been overwhelmingly a mixture of Lutheran, Reformed (i.e. Calvinist), and United (Lutheran & Reformed/Calvinist) churches, with Baptists, Pentecostals, Methodists, and various other Protestants being only a recent development. ^ "Evangelical Lutheran Free Church—Germany". ^ a b c d e f g h i j k l m n o p q r "REMID — Religionswissenschaftlicher Medien- und Informationsdienst – Mitgliederzahlen: Orthodoxe, Orientalische und Unierte Kirchen" (in German). 2017. ^ "Evangelische Kirche in Deutschland: Kirchenmitgliederzahlen am 31.12.2004" [Evangelical Church in Germany: Membership on 31.12.2004] (PDF) (in German). Evangelical Church in Germany. December 2005. Retrieved 8 April 2017. ^ a b c d e f g h i j k l "REMID — Religionswissenschaftlicher Medien- und Informationsdienst – Mitgliederzahlen: Islam" (in German). 2017. ^ Anwar, Muhammad; Blaschke, Jochen; Sander, Åke (2004). "Islam and Muslims in Germany: Muslims in German History until 1945". State Policies Towards Muslim Minorities: Sweden, Great Britain and Germany (PDF). editionParabolis. pp. 65−67. Archived from the original (PDF) on 28 December 2004. ^ "Zentralrat - Mitglieder" [Central Council - Members]. Central Council of Jews in Germany (in German). Retrieved 31 March 2016. ^ Final Report of the Enquete Commission on 'So-called Sects and Psychogroups': New Religious and Idealogical Communities and Psychogroups in the Federal Reputblic of Germany (PDF). Bonner Universitäts-Buchdruckerei. 1998. Archived from the original (PDF) on 15 December 2005. ^ "Freikirche: Altkatholische Kirche" [Free Church: Old Catholic Church]. uni-protokolle.de. Retrieved 8 April 2017. ^ "Sekten: Definitionen" [Sects: Definitions] (in German). hilfe24.de. Retrieved 8 April 2017. Büttner, Manfred. "On the history and philosophy of the geography of religion in Germany." Religion 10#1 (1980): 86-119. Drummond, Andrew Landale. German Protestantism since Luther (1951). Eberle, Edward J. "Free Exercise of Religion in Germany and the United States." Tulane Law Review 78 (2003): 1023+. Elon, Amos. The Pity of It All: A History of Jews in Germany, 1743–1933 (2002). Evans, Ellen Lovell. The German Center Party, 1870-1933: A Study in Political Catholicism (Southern Illinois UP, 1981). Evans, Richard J. "Religion and society in modern Germany." European History Quarterly 12#3 (1982): 249-288. Fetzer, Joel S., and J. Christopher Soper. Muslims and the state in Britain, France, and Germany (Cambridge University Press, 2005). excerpt. Gay, Ruth. The Jews of Germany: A Historical Portrait (1992). Harrington, Joel F., and Helmut Walser Smith. "Confessionalization, community, and state building in Germany, 1555-1870." Journal of Modern History (1997): 77-101. online; JSTOR. Kastoryano, Riva. "Religion and incorporation: Islam in France and Germany." International Migration Review 38#3 (2004) pp: 1234-1255. Latourette, Kenneth Scott. Christianity in a Revolutionary Age, I: The Nineteenth Century in Europe: Background and the Roman Catholic Phase (1959); Christianity in a Revolutionary Age, II: The Nineteenth Century in Europe: The Protestant and Eastern Churches (1959); Christianity in a Revolutionary Age, IV: The Twentieth Century in Europe: The Roman Catholic, Protestant, and Eastern Churches (1959); multiple chapters on Germany. Roper, Lyndal and R. W. Scribner. Religion and Culture in Germany:(1400-1800) (Brill, 2001) online. Scribner, Robert W., and C. Scott Dixon. German Reformation (Palgrave Macmillan, 2003). Smith, Helmut Walser, ed. Protestants, Catholics and Jews in Germany, 1800-1914 (Bloomsbury Academic, 2001). Spohn, Willfried. "Religion and Working-Class Formation in Imperial Germany 1871-1914." Politics & Society 19#1 (1991): 109-132. Tal, Uriel. Christians and Jews in Germany: religion, politics, and ideology in the Second Reich, 1870-1914 (Cornell U.P. 1975). Thériault, Barbara. "Conservative Revolutionaries": Protestant and Catholic Churches in Germany after Radical Political Change in the 1990s (2004); focus on merger of GDR after 1990.